- Hoʻoikaika ka ʻohana: Strengthen the ties of our ʻohana through Hawaiian cultural activities. - Hana noʻeau: Practice traditional protocols and simulate the work of our kūpuna. - Hoʻokāhua iā Waimānalo: Cultivate a safe and cohesive community of Waimānalo. Workshops and classes that nurture and promote family balance, unity, and harmony are available to ʻohana enrolled in HMK programs as well as the community at-large. For inquiries about all ʻohana program events, please contact our office! Please visit back for updates on wonderful events that the haumāna (students) will be experiencing with their ʻohana (family). E hoʻohuli ka lima i lalo. Back in the Spring of 2012, Hui Mālama O Ke Kai (HMK) celebrated the completion of it's first Board and Stone Class - supporting the vision of a “board and stone in every home". 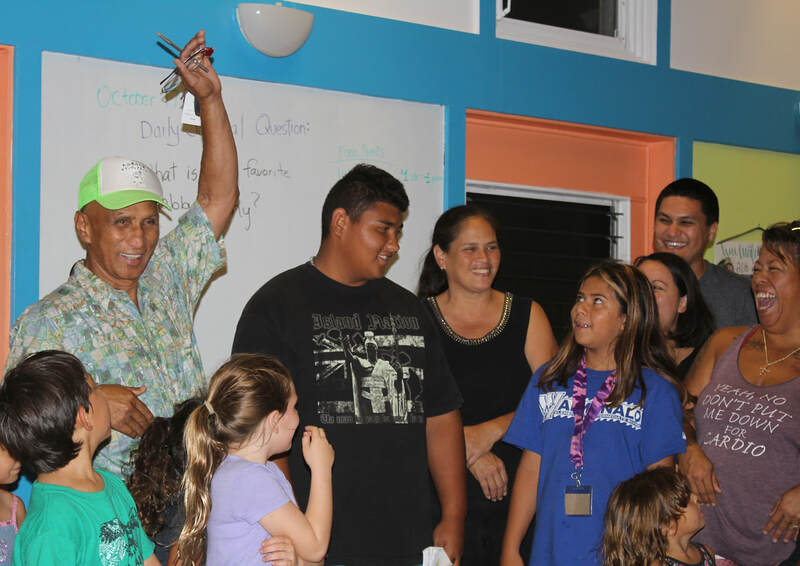 To support and encourage the continuation of cultural learning and ʻohana strengthening, HMK initiated Kuʻi Kalo Night - an event hosted once a month by HMK to provide the space and opportunity for families to have a “family night" together. Keiki are pre-occupied with hands-on learning, void of electronics - iPhones, tablets, etc. Mākua are reminded of how to spend uninterrupted quality time with their children. All are inspired to be “present" during the event. Hesitant to join us because you do not have your own board and stone? No worry! HMK has the tools and supplies you will need to kuʻi ʻai (pound food). Staff will cook the kalo ahead of time so that all attending ʻohana need to do is clean and kuʻi (pound) their kalo! This workshop is pau (finished)! Mahalo for your kākoʻo (support)! Perpetuate Hawaiian cultural practices and support the vision of "a board and stone in every home"! ʻOhana join together and learn how to work as a unit to create their own poi board and poi pounder. By looking through the lens of our kūpuna (ancestors), participants will gain ʻike (knowledge) from a cultural perspective - learning how to carve a board and shape a stone by hand, using tools you will create yourself while building stronger family bonds! ​Mahalo for you kākoʻo (support)! Hui Mālama O Ke Kai presents it's 2nd "Papahana Kālai Waʻa" Workshop. Learn the traditional protocols and methods of carving a canoe from esteemed canoe carver, Junior Coleman. This community effort will take our hui (group) through the process of carving and launching a traditional Hawaiian waʻa (canoe)!